After exploring Saturn for more than a decade, NASA's Cassini probe took a final dive into the planet's atmosphere Friday. The Cassini spacecraft's 13-year mission exploring Saturn is over. Cassini plunged into the planet's upper atmosphere at 77,000 miles per hour around 6:30 a.m. ET Friday. 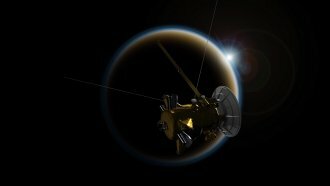 Because Saturn is roughly 890 million miles away from Earth, NASA scientists didn't receive the craft's final signal until 8 a.m.
Before it burned up, Cassini sent back data on the composition of Saturn's upper atmosphere. On Thursday, the spacecraft beamed back its last set of photos of the planet's system. Those are just some of the more than 450,000 images Cassini took of Saturn and our solar system over the years. NASA launched Cassini in 1997, and the spacecraft reached Saturn in 2004. The probe's mission ended because it was low on fuel.